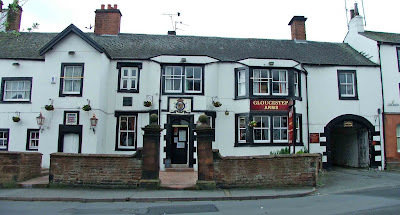 Directly across the road from the Two Lions Inn, the Duke of Gloucester enjoys continued success and use as an inn. Dating from around 1470, the building contains a core which is made from an early pele tower. Much of the building dates from the late 16th century, and the additional building work from this period has all but removed all the hallmarks and signs of the original pele tower. Historical records tell us that the property was converted to house the Duke of Gloucester (later to become King Richard III) whilst building work was undertaken at Penrith Castle....hence the defensive qualities of the core pele tower withing the current building. Also known in the past as Great Dockray, the main front door to the current inn sports the original coats of arms of the Duke, dating from around 1580. 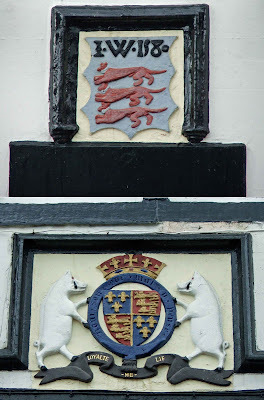 The coats of arms of the de Whelpdale family also survive on the adjacent doorhood. The interior of the building contains much 16th century plaster and panelling work. Hello and welcome to the Cumbrian Castle Blog!! If you're interested in castles or fortifications of any sort, this is the place for you. Here you will find hundreds of photos of towers and castles from Cumbria, Yorkshire, Lancashire and Scotland, and a host of other 'non fortified' buildings of interest. For a comprehensive history of my home town castle, Kendal Castle, check this link out. If there is anything on these pages that you think will be of interest to your group or organisation, please feel free to contact me if you'd like me to come along and talk to your members. I can do illustrated presentations on any subject from the castles or churches websites. All images and text here, and on the church website, are copyright ©Matthew Emmott 2019. Please feel free to contact me at matthewpemmottAThotmailDOTcom if you wish to use any of the images. Some of Kendal's interesting buildings. Some web sites well worth visiting!! Amateur photographer and local historian!! !